Tulip Poplar Lirodendron tulipifera or tulip poplar a fast growing large shade tree that can grow 15 to 20' over a 6 to 8 year period. As a specimen tree on a large property it has great beauty and in fall can be spectacular. This large, stately deciduous tree is fairly common in the eastern United States. It can grow to heights of over 100 ft with trunk diameters of 4-6 ft not uncommon as a outdoor plant. It sometimes takes a conical form, but when grown in the open it often assumes a broad columnar shape that is its signature form. The distinctive cup-shaped flowers are 1.5 in across and about 2 - 2.5 in in length and really do resemble tulips. At the southern end of its range tulip poplar blooms in spring while in its northern range they'll appear in summer. The handsome flowers are greenish-yellow with orange markings and are held at the branch tips where they can be best admired. Flowers are followed by a brown scaly cone-shaped fruit. The leaves are single squarish-lobed leaves that about 6 in long. 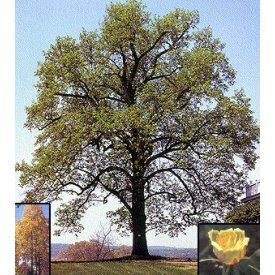 Tulip Poplar has moderate water requirements and a moderate tolerance for salt and alkali soils. Shipped bareroot, one to two foot. Shipped: Fall and spring Elevation: 2,000 - 3,000 ft, 3,000 - 4,000 ft, 4,000 - 5,000 ft, 5,000 - 6,000 ft Flowering: Blooming Growth Rate: Fast growth rate Plant Group: Tree Plant Type: Deciduous Plant Zone: Zone 4, Zone 5, Zone 6, Zone 7, Zone 8, Zone 9 Size at Maturity: 75 - 100 ft Size at time of shipping: 6-18", two year old plants growing in our nursery.